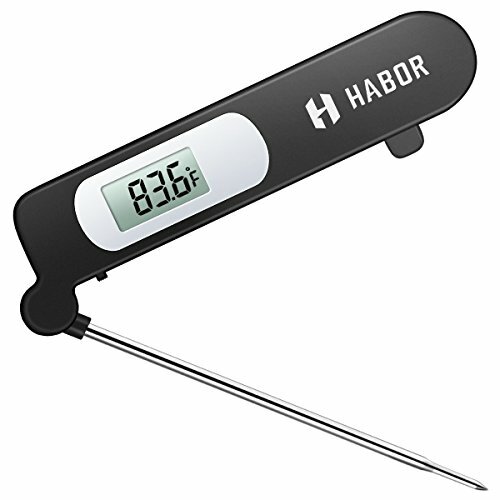 This versatile meat thermometer enables you to prepare perfect meals without slicing your food. Simply insert the long temperature probe into your food / liquid and get perfectly cooked food every single time. It can be used for Christmas turkey, meat, yogurt, beef, steak, milk, tea, oil, coffee, cheese, burger, baking, fish, candle, deep fry, barbecue as well as bath water. This digital meat thermometer will give you accurate readings in both Fahrenheit & Celsius on it's digital LCD display. It has an 5s instant response time thanks to its high precision temperature sensor, ensures you can grill steaks to your perfect doneness knowing it wont be under cooked or burnt. It’s very handy especially on check your Thanksgiving food’s temperature. This top-of-the-line cooking gadget has a 4.7" stainless steel probe that extends to a total length of 10.3", thus keeping your hands away from the heat when cooking at the grill. Convenient foldable probe design folds away easily and locks into base when not in use for portability and storage. The meat thermometer probe is stainless so you can clean the probe with a damp cloth after use, but DON'T submerse the cooking thermometer into the water or place it in dishwater. It is not waterproof.